Kombucha Chemistry: What’s in a brew? Kombucha diversification is on the rise. As more brewers rush to the scene, new and old producers alike have to answer the question: what defines our Kombucha? The uniqueness of a kombucha product can be divided into two descriptors: the microbial community and the chemical composition. The flavor, the aroma, and the mouthfeel are all sensory attributes that can be related back to the chemical composition. Additionally, the fermentation of sweetened tea can produce compounds (i.e. organic acids and polyphenols) associated with reports of health benefits. Kombucha reportedly may consist of organic acids, ethanol, vitamins, polyphenols, catechins, amino acids, and antibiotics. The measure of these bioactive compounds is paramount in determining the consumer’s experience. The symbiotic microbes within the Kombucha culture work in tandem to catabolize the sweetness from the starter material. Yeast possess an enzyme invertase which breaks down sucrose (cane sugar) into simpler hexose sugars. Bacteria and a few types of yeast can further oxidize glucose and fructose into organic acids, including acetic acid. The extent to which these molecules are broken down by the microbes determines the resulting chemical composition. Factors that influence these reactions include: microbial population, sugar concentration, fermentation temperature, and fermentation duration. 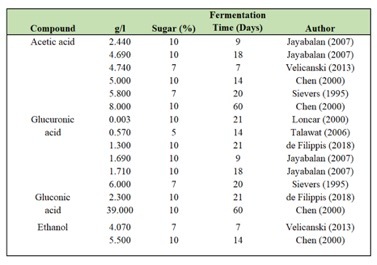 A table of varying fermentation conditions and common compound concentrations can be found below. Ethanol and pH have become standard measurements for tracking the proper course of Kombucha fermentations. Although pH is effective in clarifying the endpoint, it fails to discern the various organic acid components. Some of the more commonly reported organic acids include, acetic acid, gluconic acid, glucuronic, lactic acid, citric acid, and formic acid. Acetic acid, typically the dominant acid, is produced when acetic acid bacteria oxidize ethanol produced by sacchrolytic yeast. It is detectable at 175mg/L and carries a distinguishable pungent sourness noticeable in flavor and aroma. Fruit notes can characteristic such as apple, black current, and pineapple. Meanwhile, lactic acid is produced when fructophilic lactic acid bacteria (LAB) anaerobically ferment carbohydrates. It has very little to no aroma and contributes a “tang” sour character, distinguishable at 400 mg/L. The less abundant citric acid gives of a “tart” sour taste at a threshold of 60 mg/L. The balance of these flavor-active organic acids determines how your Kombucha tastes and smells! Increasing focus has been directed towards glucoronic acid (GlcUA) because of its association with health benefits. GlcUA acid is formed during glucose oxidation. According to one study by Nguyen (2015), the bacteria Gluconoacetobacter intermedius is capable of producing detectable levels of GlcUA acid which varies in response to yeast abundance. What’s so special about this organic acid? Numerous studies have found GlcUA to confer detoxifying benefits by binding to xenobiotics (toxins) in the liver and making them easier to eliminate. The amount of GlcUA produced during Kombucha fermentation depends substantially on fermentation temperature and the microbial composition. In addition to GlcUA, other health-related compounds, i.e. vitamin C, folic acid, polyphenols, and catechins, have been found in Kombucha, making it a likely treasure trove of beneficial compounds! How can you profile your brew’s unique chemical composition? KBI is partnering with Oregon State University to conduct a Kombucha Analyte Study. By participating, you will submit a sample of finished product to be run on Nuclear Magnetic Resonance equipment to detect residual sugars, organic acids, caffeine, and additional metabolites with high fidelity. To learn more about participation, visit: https://kombuchabrewers.org/kbi-osu-scoby-genomics-analyte-study/. Chen, C., & Liu, B. Y. (2000). Changes in major components of tea fungus metabolites during prolonged fermentation. Journal of Applied Microbiology, 89(5), 834-839. De Filippis, F., Troise, A. D., Vitaglione, P., & Ercolini, D. (2018). Different temperatures select distinctive acetic acid bacteria species and promotes organic acids production during Kombucha tea fermentation. Food Microbiology. Jayabalan, R., Marimuthu, S., & Swaminathan, K. (2007). Changes in content of organic acids and tea polyphenols during kombucha tea fermentation. Food Chemistry, 102(1), 392-398. Jayabalan, R., Malbaša, R. V., Lončar, E. S., Vitas, J. S., & Sathishkumar, M. (2014). A review on kombucha tea—microbiology, composition, fermentation, beneficial effects, toxicity, and tea fungus. Comprehensive Reviews in Food Science and Food Safety, 13(4), 538-550. Lončar, E. S., Petrovič, S. E., Malbača, R. V., & Verac, R. M. (2000). Biosynthesis of glucuronic acid by means of tea fungus. Food/Nahrung, 44(2), 138-139. Nguyen, N. K., Nguyen, P. B., Nguyen, H. T., & Le, P. H. (2015). Screening the optimal ratio of symbiosis between isolated yeast and acetic acid bacteria strain from traditional kombucha for high-level production of glucuronic acid. LWT-Food Science and Technology, 64(2), 1149-1155. Sievers, M., Lanini, C., Weber, A., Schuler-Schmid, U., & Teuber, M. (1995). Microbiology and fermentation balance in a kombucha beverage obtained from a tea fungus fermentation. Systematic and Applied Microbiology, 18(4), 590-594. Velićanski, A., Cvetković, D,& Markov, S. (2013). Characteristics of Kombucha fermentation on medicinal herbs from Lamiaceae family. Romanian Biotechnological Letters, 18(1), 8034-8042.